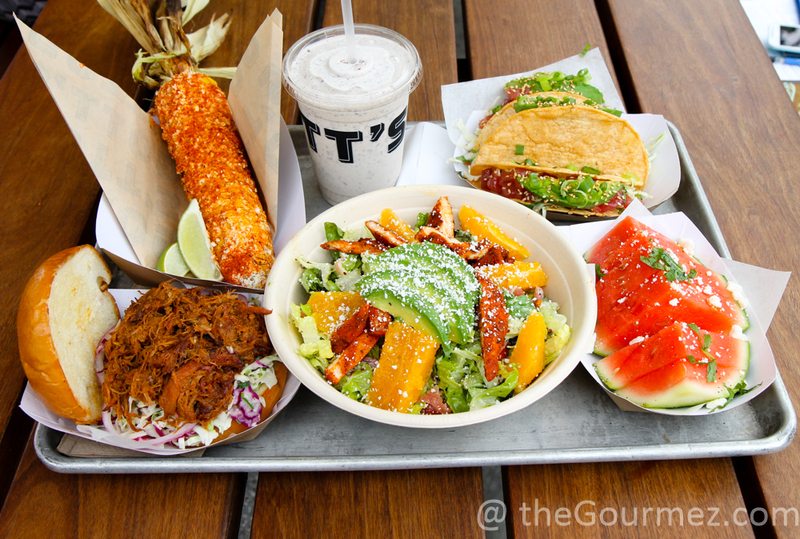 Obligatory disclaimer: The food I’m about to review from Gott’s Roadside summer menu was entirely free to me. I love when restaurants add new menu items to celebrate a change in seasons. I love it even more when they invite me out to taste them. You might think mid-August a little late to write up a summer menu, but this is the Bay Area, folks. Fogust will be giving way to our true summer in just a few weeks. 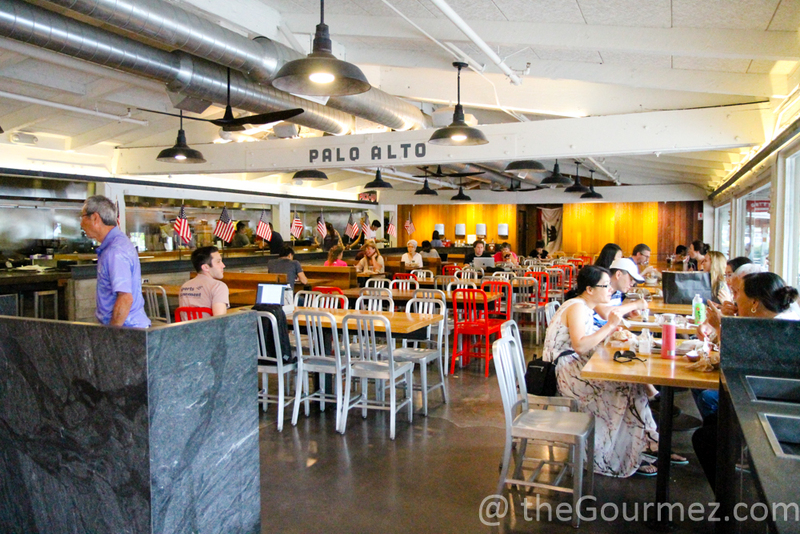 A little Fogust grey surrounding Gott’s Roadside in Palo Alto. –Though we still sat outside on the picnic tables. Better lighting! For summer, Gott’s Roadside has added three menu items to their repertoire, pulling inspiration from traditional Mexican treats and North Carolinian barbecue. 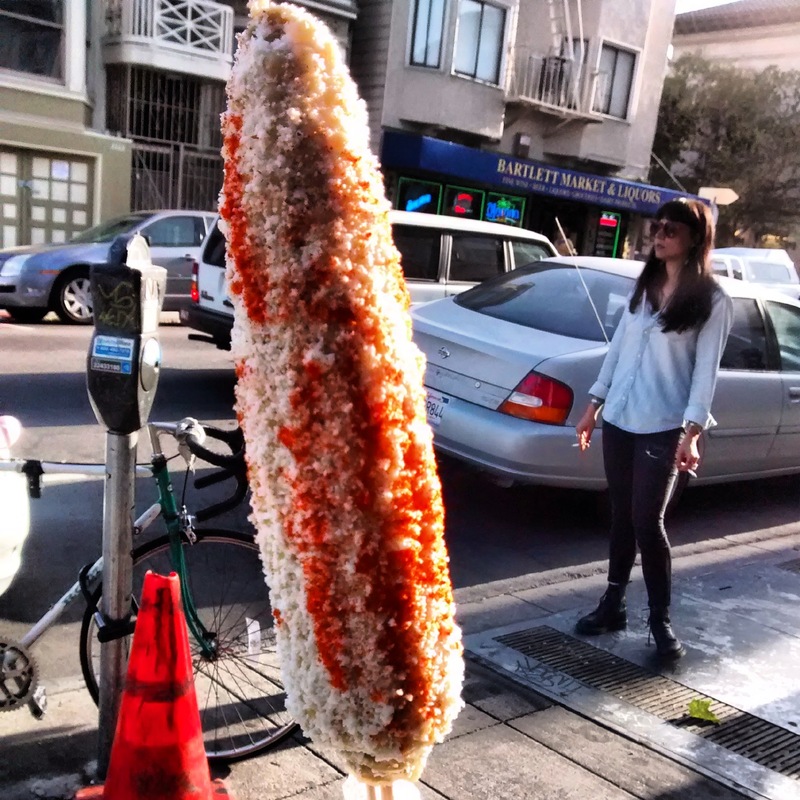 I’m going to start with my favorite, because I’m always happy to talk about elote – street corn. 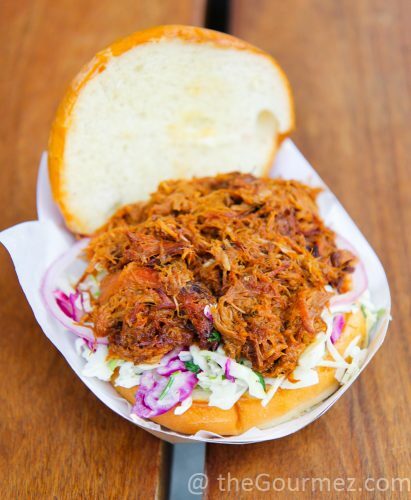 This newly trendy item has a long tradition of being sold in food carts in California. 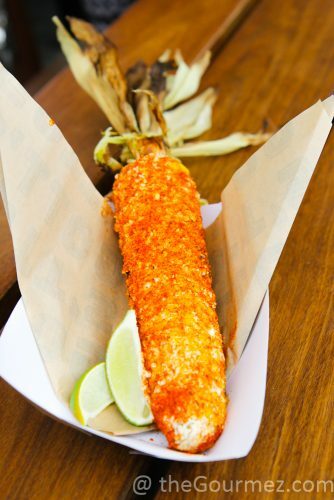 My first elote purchase soon after moving back to CA in 2013. Its history in Mexico undoubtedly goes much farther back. 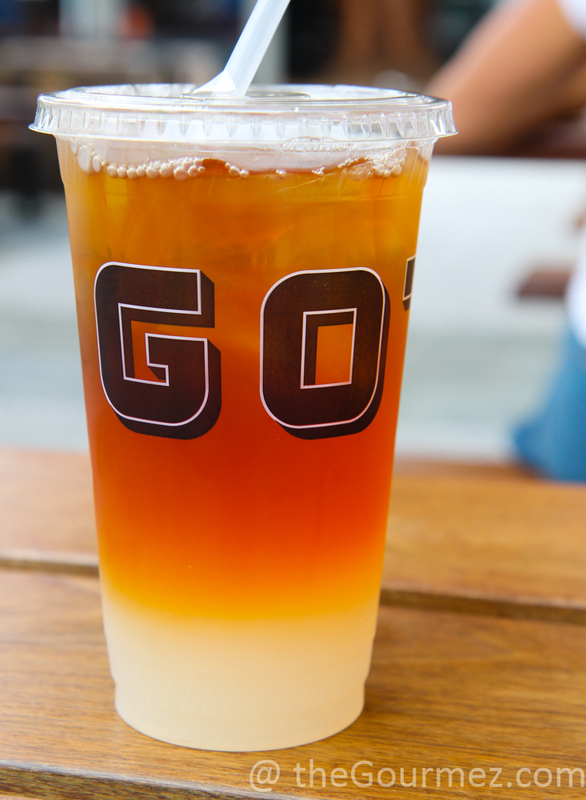 Luckily, Gott’s Roadside rendition is faithful to the original. These corn cobs are grilled—the husk shows the tell-tale char—then dipped in Gott’s crema equivalent and rolled in cotija cheese and an ancho chile spice rub. Biting into that layer of cheese was like taking a deep dive into fondue sauce—yum. Friend #1 thought there was maybe too much rub, but that didn’t stop either of us from licking our fingers after making quick work of the nicely cooked ear. Make sure you squeeze lime on top! It cuts through the richness and spice heat quite well. Also available this summer is the barbecue pulled pork sandwich, a good attempt to capture the vinegary tang of North Carolina’s famed pig. Note: Gott’s makes no claims that this is NC-style barbecue, but the similarities were pretty clear to me. It yielded near brisket levels of smokiness, which is a plus, and it didn’t go too far on the sweet scale, though it’s a good handful of sugar sweeter than North Carolina’s barbecue. In NC, they pour excess sugar into their sweet tea rather than sauce. But the sandwich was reminiscent enough of the NC style that I’d think natives would be pleased. For me, it was great! The coleslaw crunch was perfect in contrast with the buttery brioche bun that soaked in that sauce like a champ. Sliced watermelon is on any American’s picnic list, for sure, and serving it with crumbly cheese and herbs is getting more and more popular. 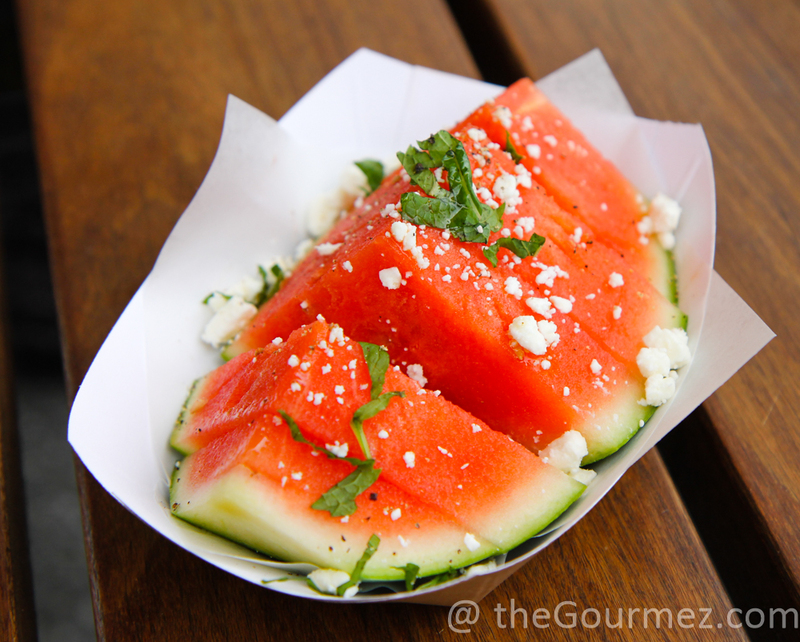 But as Friend #1 pointed out, watermelon’s usually cubed and tossed as a salad when served those accompaniments. Gott’s Roadside probably should have opted for that presentation as the wedges basically act like a slide for the cheese and herbs to roll down. I also would have liked more herbs, period. I tasted some parsley, but I’m not sure there were any others involved, and a watermelon salad yearns for mint–I can see it on that photograph, but I couldn’t taste it! Though I did love the sprinkle of pepper on top. The three summer items would have been plenty for a filling meal, but this was my first Gott’s Roadside experience, so I took up the manager’s suggestions to try a couple additional bright and lively items to get a fuller picture of their wares, both literally and figuratively. And I’m glad I did, starting with a milkshake. Mmm, dairy. The Mint Condition flavor is essentially a natural peppermint version of mint chip ice cream, though with just the right liquids-to-solids ratio to make it refreshingly thirst-quenching. I, um, I probably could have drunk it all down real fast if challenged. The amount of shredded chocolate chips was impressive. 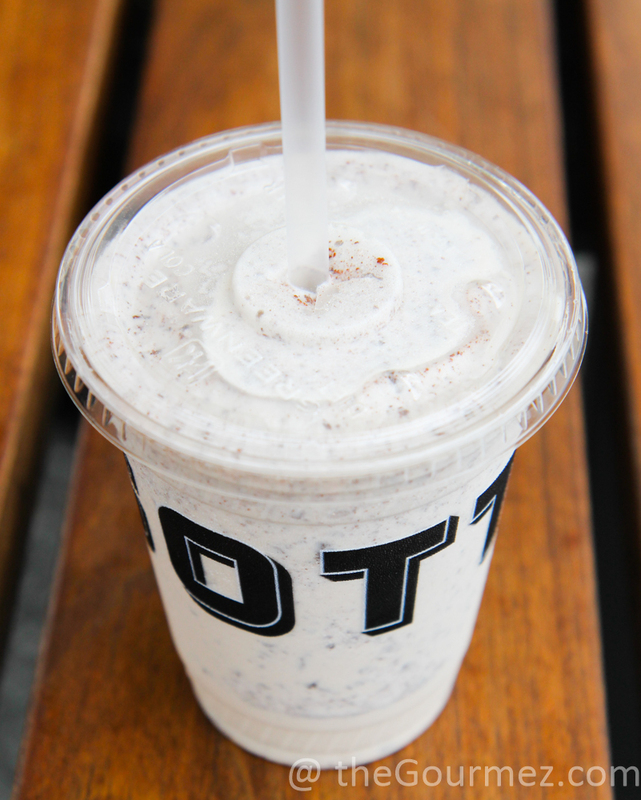 It’s a good shake! 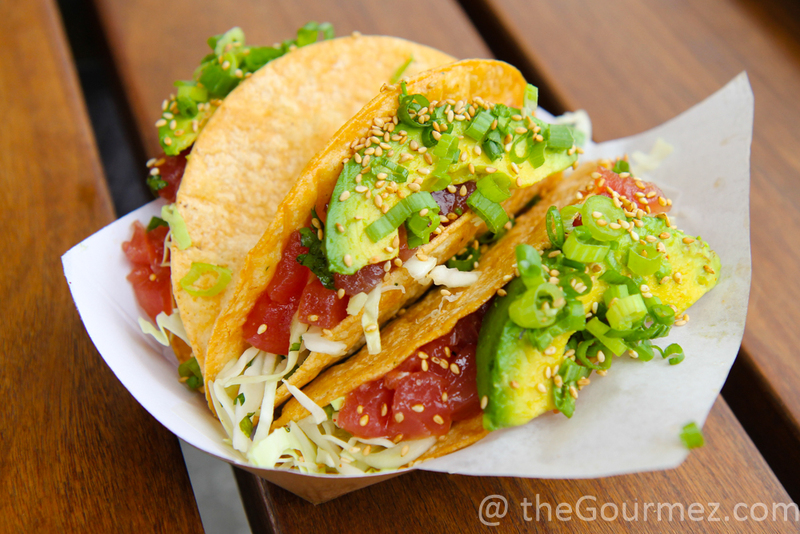 The ahi tuna poke tacos would make a filling meal all on their own with three tacos per order. Visually pleasing, the tuna tasted fresh and the taco shell was remarkable. It’s just fried yellow corn, but the shell was so thick, I thought it might be a play on a rice cracker to go along with a sushi feel. I was totally wrong, but it went great with the fillings and a sprinkle of sesame seeds tied the theme together. There’s no fear of this taco falling apart, either, which is always a plus! But the slaw could use some jazzing up, and the spicy mayo would make a lot more sense drizzled on top rather than chilling on the bottom layer by itself. We also enjoyed a citrus and avocado chopped salad from Gott’s regular menu. The chile rub is asado-style for the chicken, which comes from the Chilean barbecue tradition. 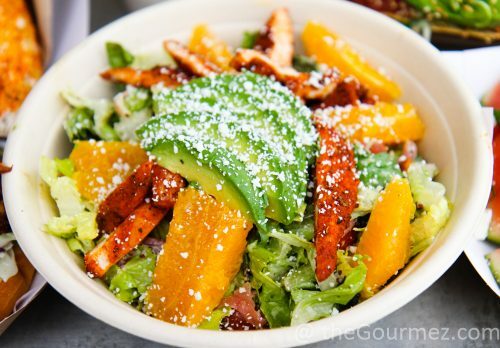 I loved the rub’s flavor, and it contributed a lot to the salad overall. A spring lettuce mix formed the bed for a combination of quinoa, black beans, cotija, and avocado with cilantro-pumpkin seed dressing. I’d prefer a more robust dressing, but I like the creativity. Friend #1 especially enjoyed the finely sliced pickled red onions. Even a standard drink gets a thoughtful, and colorful, treatment here. Friend #1 found it more tart than most Arnold Palmers, which is a bonus in my book and likely the result of Gott’s Roadside making their lemonade in-house. That level of detail in a faster food establishment gives me confidence their gourmet burgers and fries will be delicious when I make it back someday. Maybe paired with a glass of Turley Juvenile Zinfandel to dress it all up? 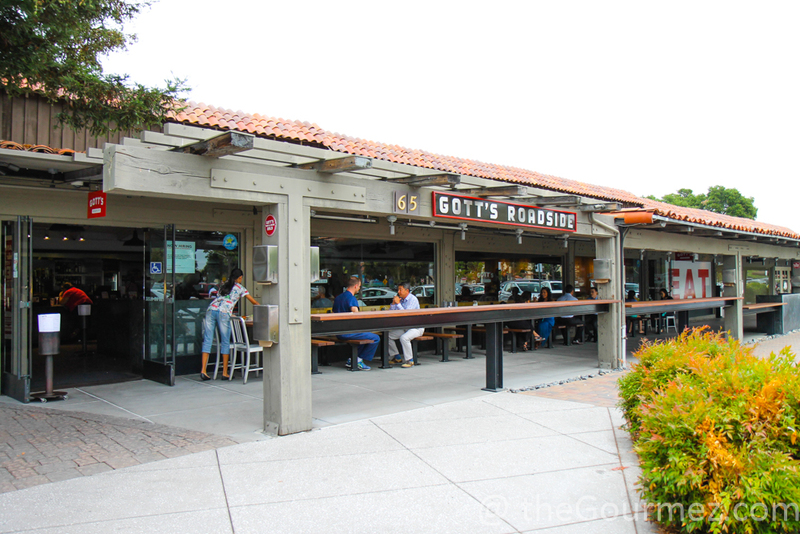 Yes, Gott’s has a curated beer and wine list as well. Even when we “picnic,” Northern Californians know how to kick it up a notch. The next I’m an in Palo Alto I would like to check out this barbecue place. I never had elote, it looks good. Elote is *amazing*! I could eat it every day. Best way to eat corn.